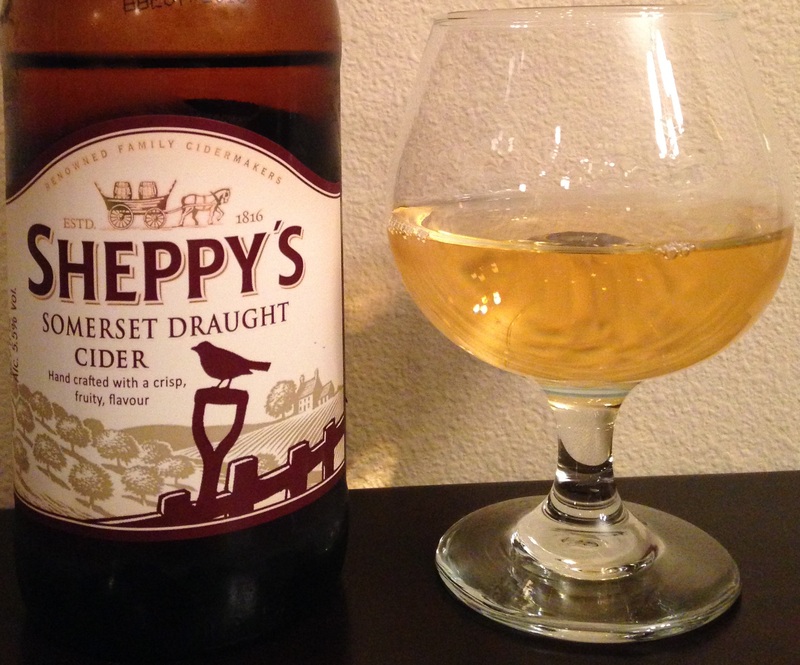 Review of Sheppy’s Somerset Draught Cider. This is the second Sheppy’s cider I’ve had; the first was their Oak Matured cider, which was truly amazing. Availability: Wide release in UK, but likely limited in the U.S.
Cider Description: First created in 2010, this product combines traditional cider apples and eating apples to produce a crisp fruity cider. Medium taste. This cider was oak barrel aged. Cidery Description: Farming 320 acres at Three Bridges Farm since 1917, three generations of the Sheppy family have weathered the ups and downs of farming and cidermaking by embracing change and opportunity. Craftsmen cidermakers for over 200 years. Quality is central to all our ciders, which are produced from local and home-grown apples here at Three Bridges Farm. Modern technology has been used to assist the completely traditional production of fine English cider, but never to compromise the quality which is associated with the name Sheppy’s Cider. We are proud to share with visitors from far and wide our beautiful farm and orchards, and to show you as much as possible of how and where we make our delicious ciders. First Impression: Medium straw yellow hue. Still (no carbonation), despite the label saying it was lightly sparkling. Smells dry, acidic, tart, yeasty, and appley. Opinion: On the sweeter side of semi-dry (so my nose deceived me on the level of sweetness). Mild tannins, tartness, and acidity. No bitterness, sourness, or funk. Slightly rich, but still fairly sessionable. Medium bodied. Moderate finish length. Mild notes of honey, vanilla, and oak. This would particularly make a nice summer cider. I wouldn’t however call it overly fruity or apple-forward. Most Similar to: Other English ciders, although its a bit on the lighter side (slightly less rich, less tannins, and less bitterness). Closing Notes: Yum! I really enjoyed this cider. However, I preferred their Oak Matured, as it was more rich and had a lovely heavy oak influence. Both cider are very good values, especially for imported craft cider. Most other imported English ciders seem to run a couple dollars more per bottle, and I haven’t enjoyed them nearly as much. Have you tried any Sheppy’s ciders? What did you think? I live in Somerset so am within a stones throw of Sheppy’s and many many others. Great to see they are making it over the pond!